Hey, if he sees yoga and pilates and meditation as cults, it's no wonder he sees Lucky Mojo as a cult. His confusion of African American folk magic of the Southern United States with a Haitian religious cosmology is a bit more problematic, though. He could use a history lesson and a geography lesson. You know, the old, "Just because two words rhyme, that doesn't mean they are the same thing" lecture, the one that concludes, "I mean, your head is not bread ... right?" This would be very funny except that you are living through it and it is having a drastic impact upon your freedom of expression. Again, if i can be of any service, don't hesitate to ask. Mama Micki wrote: Many rootworkers have had to practice in secret. It just takes some planning and ingenuity. Whatever I do has to mostly be done either on the back seat of my truck (tinted windows) or inside when no one is home. Where there's a will, there's a way. thank you so much for your help. I do have Pay Me on hand as well. Brilliant idea. 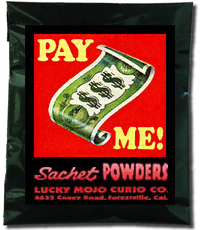 I would order the two items noted -- Court Case Sachet Powder and Pay Me Sachet Powder. Dust the paperwork and pray over it for success. Use Psalms #35. Place the paperwork in something (like a folder) to protect them. Light your anointed brown candle on top of the protected paperwork. Remove the paperwork, fick excess powders off, and submit them. Obskultus, you are in many of our thoughts and prayers. Wow this is crazy! I went to a Catholic College myself but it was liberal. Still this shocks me. "Jobless and without money, I can't reasonably find work on campus anymore and my tuition may be difficult to pay. But I plan to begin a novena to St. Joseph and St. Peter, per your instructions, after the bath tomorrow. " Those are good suggestions. You sound a little (understandably) hopeless though. If that is the case St. Jude is good for impossible situations. My grandmother swears by him. Obskultus, have you posted a prayer request at the Crystal Silence League? I'd love to get that on my altar. I added a new request over at the Crystal Silence League per the suggestions of some folks here; I definitely appreciate this community's support, prayers, and advice. My belongings were returned and I'm trying to reorganize things -- next Wednesday I have my interview with miss Cat to discuss beginning the Correspondence Course. I'm hoping to do my egg cleansing soon, but haven't had the opportunity. St. Michael has def. been big in my work lately. Oh I am completely outraged by this! I understand what you are going through because I have been persecuted just the same but by my own family member. My eldest sister will not listen to any genre of music accept for Catholic music. She complained about my husband's piercings (she believes that's a bad example for her daughter), she consider my marriage to my husband which was done through the registry as under God's eyes "not consecrated" because it wasn't done in church. She wouldn't let her children near me and she disapprove of pilates and yoga as well and not just the practice, the music as well. I you this post finds you well. I was in nursing school and my teacher tampered with my test, caused me to fail, and got me kicked out of nursing school. I have been a licensed clinical nurse aid since 1997, so I thought i would further my education so that I may better help people for the rest of my life...but my teacher shattered my dreams due to her discriminatory ways and due to my age. I would please like suggestions and possible product usage thank you. Are you actively challenging this? Do you have proof that your test was tampered with, and have you considered handling a lawyer? Also, have you considered attending another school? In this case, I would work with essence of bend over rather than compelling. I think that is just low down with what this person did. Next, I would work with court case products to help you fight this case. ALong with road opener products, and crown of success. Stars gave excellent advice, here are my additions: Who is your teacher's supervisor? I would write him/her a letter dressed with Crown of Success and Do as I say sachet powders. If there is a board involved or if this is a board decision write all of them letters and document, document, document. Follow up phone calls are good-make it personal and show them you will not take this lying down. Put any and all decision makers into a honey jar with a petition that they favor and cooperate with you. Working with a member of AIRR for this is definitely a good idea. Wow, my heart goes out to your and your friends, I too was a conjure woman attending a Catholic university. However, I was a very outspoken Pagan and practitioner, to the point of going around and giving speeches about the truth behind the negative propaganda aimed at my kind and what we do. It went over rather well (save for a few ignoramus', but you always get a few, right?). I had altars and herb cabinets and whatnot in my dorm room, and nothing ever came of it (except for lots of students coming to me for all kinds of things at all hours, lol). What's happening in your school is illegal, it's religious discrimination, it's causing you emotional distress (something that people sue for millions of $$$ over), and you've been vandalized based on accusations (as in, no probable cause). I agree with Cat, document EVERYTHING, and threaten (but mean it) to go to the press and social action groups with your story. Even better, threaten a lawsuit for the vandalism, discrimination, and emotional distress (and cite the Civil Rights Act). Nobody wants to catch a case or shell out for a legal team, so if you show you're serious, they might just back off. I'm certainly not here to give legal advice, but religious institutions are held to a different standard as far as discrimination is concerned. For example if a particular church has a prohibition against drinking alcohol, and a student at its college violates that rule, he or she could be expelled. There was a case recently of a private religious school that fired an unmarried pregnant teacher, although she had planned to marry the baby's father. Of course, going public may be the answer, although it may backfire, as many people will take the college's side. A lot of people are against the practice of magic, both for religious reasons and because it is regarded by many as "superstitious nonsense." thank you so much miss cat. i got the products and followed your instructions. I have a date set for june, which i will be doing more work on this 9 days prior to the date. Interesting thread and I am sorry to hear about your troubles and the sad way in which they treated you. Besides the many good advices already given in this thread I would consider what happened prior to this hell breaking loose. Did you fail to fullfil some promise you made to a spirit? Did you ask Santissima for something in particular that can have offended her (considering the way the statue was turned upside down)? Did you curse someone? This whole thing smells like the work of an unhappy spirit. Dr Johannes wrote: Besides the many good advices already given in this thread I would consider what happened prior to this hell breaking loose. Did you fail to fulfill some promise you made to a spirit? Did you ask Santissima for something in particular that can have offended her (considering the way the statue was turned upside down)? Did you curse someone? This whole thing smells like the work of an unhappy spirit. Thank you Johannes for responding with those questions. It is always good to look at any situation from as many situations and angles as possible. I wonder the very same things in this case. I have a situation that is slightly complex and I would love any suggestions on where to start with spell work. My new husband and I recently purchased a manufactured home. My husband began the process back in February 2013. Since he began working with this mobile home company there have been constant delays, redoing of paperwork and excuses as to why our home was not ready. Anyway, after a lot of battling we finally had our home delivered to our lot in the beginning of November. My husband completed all of the paperwork, which included the mortgage payments and interest rate, got the keys to the home and we moved in. The weekend before Thanksgiving the sales man that my husband had been working with called his father (claiming he was afraid to call my husband? who is a pretty calm guy for the most part) saying that the paperwork for the home needed to be resigned because he did not realize the lot was rented and not private. I found that hard to believe since the mobile home company had previously been in contact with the property mangers we rent from. My father-in-law told him he needed to call my husband and not him. He also asked him directly about the interest rate in which the sales man told him he wasn't sure but thought it might be lower. Either way, my husband agreed to meet with him to resign the paperwork. We met him to redo the paperwork on Friday, the day after Thanksgiving. He told my husband that all he had to do was sign the pages and we would be all set. I asked him about the interest rate (which he never brought up) and found out that our rate was going up almost 3% making our mortgage payments $100 more a month. I confronted him about the raise in interest and he insisted that it was the bank and not him. He also told me he had told my husband's father that it would go up, which he did! The sales man seemed nervous, like he wanted to be gone and I felt that something was very wrong. I told him that we wanted time to discuss and look into the changes before signing the paperwork. His response was that if we didn't sign the new paperwork we would be forced out of our home, where we had already moved in and been living in for 3 weeks. He continued to go on and on with sales intimidation tactics along with underhanded comments about how much work they went through to get us the home. We signed reluctantly for fear of being forced out. If it had been a regular, non-holiday, workday I would have drove gone to the court house down the road for legal advice. Since then I have felt like this seems very wrong somehow (aside from the financial part), very shady and feel we were taken advantage of. My husband and I will be consulting a lawyer this week to see if what happened was legal. What I want to know is what if anything could/should I do magickally to have things fixed and place in our favor? I may also need court case spell work but until we speak with a lawyer I'm not sure of what can be done. It's hard to say. I just know that something is very wrong with all of this. Does anyone have any thoughts or advice on where I should at least begin spell working to fix this ongoing problem? Sorry for the very long posting. I'm so sorry to hear you are going through this. Because of the complicated nature of this issue I would encourage you to seek out a reading. A reader/rootworker can get to the root of the problem. You can also be coached on what to do. 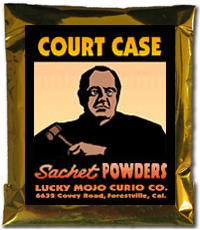 Court case products are good to have on hand. Seek out an attorney, have him look at the contract. I'm not an attorney but it sounds like you signed it under duress. That may be enough to break the contract but only an attorney can advise you legally. I wish you the best and a positive outcome! Thank you Susan for responding to my post. We have scheduled an appointment with a lawyer later in the week and we will see what can be done legally. I will be sure to check out the link for readers and court spells work. I would like to get your help. I am one of several people who is suing our condo board of directors for fraud and filing false liens against our property, among other things. The lawsuit has been dragging for two years now, but the other side is starting to show a few signs that they may be about to crack. The court ordered the condo association to do an audit of the books more than 6 months ago, and they keep stalling and not doing the audit, most likely because they dont want their fraudulent actions to come to light. The lawyer for the board of directors has been cocky until recently, but now he appears to be getting desperate and starting to cave under the pressure because they are running out of lies and excuses for not obeying court orders. What I want to do is cause the defendants' case to crumble and cause them to cave to the point they will agree to settle with us. If the lawyer for the board of directors continues to stall and screw up, their case goes down the drain! I was wondering if I should use LM's Confusion candle (so that the lawyer is more confused and incompetent than he already is), the Essence of Bendover candle, or maybe use both? Me and the other plaintiffs want to bring this case to an end for once and for all, and I want to do what I can to push the board's lawyer over the edge and screw up big time! Thanks in advance for your suggestions and advice! Interesting choice, SoFlaDiva. I think a Confusion candle on the lawyer, a Bend Over candle on the condo board of directors itself, and Court Case work: don't stop with a few candles! And, while you're at it, make that an INFLAMMATORY Confusion candle -- or several. Make 'em fuss and fight. Thanks so much Miss Michaele!